Astrophotographer John Chumack took this photo of the Orion Nebula, M42 (NGC 1976) and De Mairan's Nebula M43 on Sept. 22 from his observatories in Yellow Springs Research Station in Yellow Springs, Ohio. He used his homemade 16" diameter F4.5 Fork Mounted Newtonian Telescope and QHY8 cooled color CCD camera to capture the image. A stargazer in Ohio captured this incredible view of the Orion Nebula while waiting for another cosmic night sky sight. Astrophotographer John Chumack was killing time while waiting for Comet ISON (a potentially spectacular comet making its closest approach to the sun in November and December) to rise when he captured this beautiful image of the Orion Nebula, M42 (NGC 1976) along with neighbor, De Mairan's Nebula M43. "The Orion Nebula is such a fantastic object that I just can't resist capturing a new shot each season," Chumack told SPACE.com via email. Chumack took the photo on Sept. 22 at his observatories in Yellow Springs Research Station in Yellow Springs, Ohio, over 40 minutes with his homemade 16" diameter F4.5 Fork Mounted Newtonian Telescope and QHY8 cooled color CCD camera. 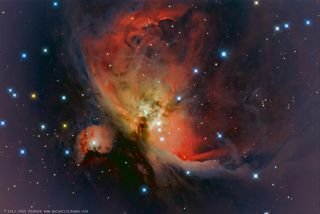 Located approximately 1,500 light-years away, the Orion Nebula is the nearest region of massive star-formation to Earth. Located at the heart of the nebula is a group of gigantic, young stars; collectively called the "Trapezium" because of the shape they make. Chumack took 62 separate various length exposures, ranging from one second to 300 seconds, after which he carefully layered the exposures to prevent over exposure of the Trapezium cluster. Also visible around the cluster are little brown specs called Bok Globules, which are newborn stars. "The Constellation of Orion is rising higher in early morning sky and M42 is so bright and has such a high dynamic range that most shots over expose the Trapezium and nebula center," Chumack said. Surrounding a single bright star, M43 is the little bubble-shaped area toward the lower left side of the image.